It is the one that I pull out the seedling rice from the rice nursery in childhood and planting rice was done by the hand. However, because planting rice is done with a rice transplanter today, it is necessary to master the rice transplanter well. Because rice-transplanting machine is the thing which I used a pot seedling of "Minoru" for in my home, the seedling box becomes a thing for exclusive use of the pot seedling. I pull out the pot seedling from a small soil seedling box with that a seedling is called a pot in the case of rice-transplanting and plant it. In other words the number of the seedling is decided by a seedling box beforehand. Because one-stock jar seedling has adhered to the seedling a lot of soils, and exists in the jar, it is a feature that taking root after planting rice is good. There is a method that the jar seedling is not used, too. It is said the mat seedling, and is the one that the paddy is sown, it grows, and only the seedling was made like the mat. The soil has hardly adhered to the seedling. This is pulled with the rice transplanter and planted while tearing. This does planting rice with the rice transplanter for the jar seedling. It is a walking type planting rice machine for Article 2. It is not necessary for the small-hold farmer like me recently though there is a passenger use planting rice machine for Article 4, too. This rice transplanter does times the person the function how many. It is what became convenient. When I make a pot seedling at home, I sow paddy about 40 days of the rice-transplanting ago and sow a kind in a plane. I sow paddy and will raise it later. Raising of seedling makes a seedbed in the rice field and does temperature management adequately and raises it. I manage the water every day till a seedling grows enough. It takes trouble very much. How to use rice transplanter and how to plant it. Do it and have a persimmon after pouring water into the rice field. Do it, and the back of the persimmon plants rice after making water a little small. When there is too much water, at the time of rice-transplanting, a seedling falls down by a wave of the water. In addition, I keep a rice field intact for about 1 day if I do it and have a persimmon. It is muddy, and soil is too soft and cannot plant a seedling. After it thinks about how to plant it and the planting order well, it does to do planting rice to rice field with the rice transplanter. When use is bad, even a good machine cannot plant it well. I begin to plant it from a side near the straight line by the longer direction in rice field as shown in this figure. It plants it while having a moderate interval left on beginning plant and the side of finishing planting. It plants it from the invasion of rice field and the outside on the leaving road at the end. It plants the inside and it goes out of the leaving road besides rice field when just coming to the other side. There is hardly a necessity that will be adjusted later if it makes it to good thus. The way is the same also in a passenger use rice transplanter. 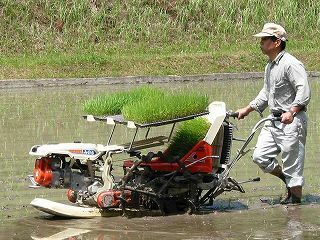 It is the one not planted straight easily when planting rice is done with the rice transplanter. It has a little knack in planting it straight. The distance is seen by eyes as shown in the photograph above. The under ..planting.. soon need not always be seen. However, it is necessary to see whether to be planted sometimes well. It corrects it little by little while planting it when bending. The row of beginning plant can be gradually made a straight line by planting it by rows how many though it is considerably curved when extreme. It is checked whether each part is seen before the engine of the rice transplanter is started and abnormality exists. It is checked whether the effective condition and the play of the brake and the clutch are suitable. It makes it to the start position in which the accelerator lever was pulled from low speed a little. Both of the clutch levers are pulled and it puts it into the state of cutting. The chalk lever is pulled when the engine is cold. The engine key is adjusted to the position of the start. The starter is pulled and the engine is started. The chalk lever is returned. The decided place in each part is oiled before the rice transplanter is used. The key key might ring if it doesn't oil it because it uses it only once a year. Do not oil parts that can be done with the rubber product. After washing off dirt with the brush etc. , the rice transplanter that finished being used wet-cleans deliberately. It lightly wipes it with the cloth to do oil so that the metallic portion should not rust and to see. Because the belt is an articles of consumption, it exchanges it once every several years.